A dihydrofolate reductase inhibitor (DHFR inhibitor) is a molecule that inhibits the function of dihydrofolate reductase, and is a type of antifolate. Since folate is needed by rapidly dividing cells to make thymine, this effect may be used to therapeutic advantage. For example, methotrexate is used as cancer chemotherapy because it can prevent neoplastic cells from dividing. Bacteria also need DHFR to grow and multiply and hence inhibitors selective for bacterial vs. host DHFR have found application as antibacterial agents. 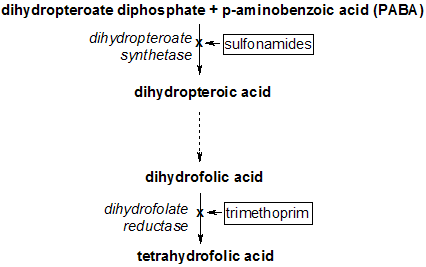 Classes of small-molecules employed as inhibitors of dihydrofolate reductase include diaminoquinazoline & diaminopyrroloquinazoline, diaminopyrimidine, diaminopteridine and diaminotriazines. The examples provided below are specific molecules belonging to one of the above-mentioned classes. Oral piritrexim, a treatment for metastatic urothelial cancer. ↑ Huennekens, F. M. (1994). "The methotrexate story: A paradigm for development of cancer chemotherapeutic agents". Advances in Enzyme Regulation. 34: 397–419. doi:10.1016/0065-2571(94)90025-6. PMID 7942284. ↑ McGuire, John J. (2003). "Anticancer antifolates: current status and future directions". Current Pharmaceutical Design. 9 (31): 2593–613. doi:10.2174/1381612033453712. PMID 14529544. ↑ Hawser, Stephen; Lociuro, Sergio; Islam, Khalid (2006). "Dihydrofolate reductase inhibitors as antibacterial agents". Biochemical Pharmacology. 71 (7): 941–8. doi:10.1016/j.bcp.2005.10.052. PMID 16359642. ↑ Srinivasan, Bharath; Skolnick, Jeffrey (2015). "Insights into the slow-onset tight-binding inhibition ofEscherichia colidihydrofolate reductase: detailed mechanistic characterization of pyrrolo [3,2-f] quinazoline-1,3-diamine and its derivatives as novel tight-binding inhibitors". FEBS Journal. 282 (10): 1922–38. doi:10.1111/febs.13244. PMC 4445455 . PMID 25703118. ↑ Srinivasan, Bharath; Tonddast-Navaei, Sam; Skolnick, Jeffrey (2015). "Ligand binding studies, preliminary structure–activity relationship and detailed mechanistic characterization of 1-phenyl-6,6-dimethyl-1,3,5-triazine-2,4-diamine derivatives as inhibitors of Escherichia coli dihydrofolate reductase". European Journal of Medicinal Chemistry. 103: 600–14. doi:10.1016/j.ejmech.2015.08.021. PMID 26414808. ↑ Matlashewski, Greg; Mui, Ernest J.; Schiehser, Guy A.; Milhous, Wilbur K.; Hsu, Honghue; Roberts, Craig W.; Kirisits, Michael; Muench, Stephen; Rice, David; Dubey, J. P.; Fowble, Joseph W.; Rathod, Pradipsinh K.; Queener, Sherry F.; Liu, Susan R.; Jacobus, David P.; McLeod, Rima (2008). "Novel Triazine JPC-2067-B Inhibits Toxoplasma gondii In Vitro and In Vivo". PLoS Neglected Tropical Diseases. 2 (3): e190. doi:10.1371/journal.pntd.0000190. PMC 2254147 . PMID 18320016. ↑ de Wit, R; Kaye, SB; Roberts, JT; Stoter, G; Scott, J; Verweij, J (1993). "Oral piritrexim, an effective treatment for metastatic urothelial cancer". British Journal of Cancer. 67 (2): 388–90. doi:10.1038/bjc.1993.71. PMC 1968166 . PMID 8431372.